We took this photo last weekend, and all week, I’ve been planning to share it here with some reflections, except even though I have written thousands of words this week, none seemed to be quite right for this space. I’ve got a number of small writing projects in the works, so I make small word-deposits every day in different documents as I build on ideas and thoughts in specific directions, but I’m finding the deeper I get into the writing life, the more I realize how important it is to write for the space, for those who will read. But who reads here? Perhaps you should leave a comment or send a note and let me know. And if there is anything you’d like me to write about or ask me about, please include that. I have an ample supply of words, but a bit of a question mark in my mind about what belongs here right now after the long break I’ve taken from regularly writing here. It’s Saturday morning. Two kids are sitting on the couch, building legos out of a yellow plastic box. Little man just waltzed into the living room with two clementine oranges, one in each hand. He offers it to his older brother and invites him over to the dining room table, where he wants to peel and eat them together. Brother declines and says he doesn’t really like oranges. “Yes you do,” he says. “No, I don’t,” says big brother. “Yes, you do,” he insists, belligerently. We all laugh at his persistence, and the innocent way he is trying to command the situation. Deciding it would be easier to just take the oranges to the table and eat them both himself, he peels the skin back in irregular pieces, discarding them indiscriminately on the table and floor before shoving huge hunks into his mouth. Dad is in the kitchen, grinding fresh coffee and gathering the assorted pieces of his supplies to make a wake-up cup. We have an overabundance of coffee stuff. I don’t drink it, never have, but I have enjoyed the smell of it ever since I worked in several drive-thru coffee huts in high school. Caffeine, even in smaller amounts, has always made me feel not great, so I’ve steered clear even though I’ve had many opportunities (and reasons) to develop the habit. Dad, on the other hand, has a well-developed affinity for it. Every few years, we add new coffee supplies to our growing collection and each is used for a while before being abandoned for another method. We’ve had a french press, Aeropress, Bialetti pot, Keurig, Breville espresso maker, and probably a few other things I’m forgetting. It’s probably time to pare down what isn’t being used, but since it’s not my zone, I just leave it be. Our near-teenager is in bed still, even though it’s 9:30am. I’ve noticed a sharp turn in her sleep habits in the past few months. She doesn’t settle easily in the evenings, always stretching her bedtime as late as we’ll allow. Many times, we ask her to turn her lights out, which she’ll do until there is no longer a parent nearby and then she’ll flip her little lamp back on to continue reading whatever book she’s sucked into currently. It’s hard to hold the line on it because I remember my own early teen years and how late into the night I would stay up. I spent a lot of time pondering and puttering around my room and enjoyed the time to myself without interruptions. We have to strike a balance because, in the mornings, she can be a bear if she’s not able to sleep as late as she wants to, which is not always an option. It’s definitely new territory trying to sort out where to apply leadership, and where to step back and let her have autonomy. We’ve taken to having conversations about looking ahead to the next day. Will she be able to sleep late enough for a full night? If not, she needs to disengage from her juicy good book and choose rest. To sleep or to read? That is the question. I have to say, I’m glad that this is currently our biggest challenge with her individually. The table is full of dishes from dinner last night and lazy breakfasts this morning. I’m not especially good at keeping the table top clear. It feels like a losing battle at this point. We rally two or three times a day to reset and prepare for the next planned meal or to create space for projects and school work, but in-between, I have to let it go for my own sanity. Even when we use paper plates for one meal of the day, we have to run the dishwasher twice daily to stay square. There are just so many people, and given that each one often uses multiple dishes per meal — let’s just say staying ahead of the mess is an ideal I may not reach for a long time. We have been making strides at post-Christmas organizing, though. Usually, I emerge from the holidays in a fog, not quite sure how to navigate the influx of stuff that comes in, and not quite ready for the return to a normal weekly schedule of activities out of the house. This year, our entrance into January has been gentle. I’ve been making a list for the kids, detailing things we need to tackle, and everyone completes a bit of it. Everyone contributes effort, except the two-year-old who seems intent on undoing everything as efficiently as possible. Alternating the upstairs and downstairs spaces each day, we’ve emptied bins, cleared out closets, and have accomplished some of the cleaning we don’t always get to. Simplifying is a great way to start the year. I wrote a ‘launching into January’ piece over on Kindred Mom earlier this month, and I’m now a few steps into setting my own vision for the year into motion. It is a gentle approach compared to years past. I know with a baby coming in a few short months, there is only so much I can plan, and even those plans must be held with an open hand. In the planner I’m using for the year, one of the questions posed was, “What do you want to leave behind this year?” My list was longer than I expected and even surprised me a bit as I scrawled it out. 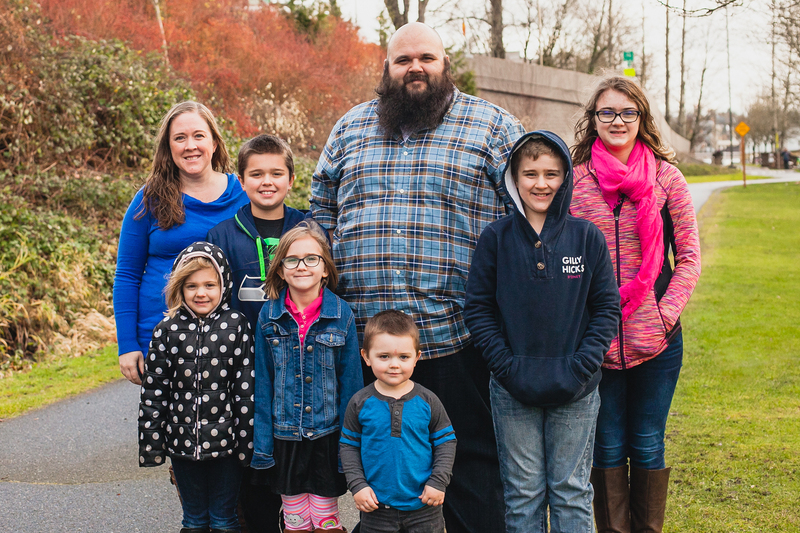 What I long for most this year is deep growth, habits that serve me (and our family) well, and quiet confidence in the direction I’m headed. In the past, I’ve always wanted to be able to show (or prove, rather) productivity and ground gained, but the events of recent months have shifted my perspective about a lot of things. I wrote, “I want to pursue diligence motivated by faithfulness rather than motivated by productivity,” and I’m starting to really understand the difference. My themes for this year are: slow, thoughtful, substantial, sustainable, focused, joyful, faithful, and my goals are aimed more at depth, quietness, and seeing the beauty of very ordinary moments than at smashing through an impressive to-do list. There are times to hustle, for sure, but hustle is not the only way–and possibly not even the best way–to get the most out of life. Some sweet things can only infiltrate the soul when you slow down, take notice, and savor what would otherwise be missed at a breakneck speed. “With all my heart, I want you to know that your dreams and goals are valuable and important, but the pressure to produce results in one thing you can check at the door if you want to. 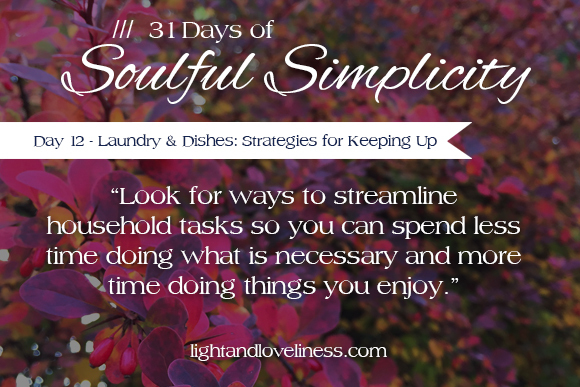 This is day 12 of Soulful Simplicity, a 31-day series through the month of October. The first week of the series can be found here. I hope you are enriched by this series. If you have any questions or would otherwise like to connect, feel free to send me a note: lightandloveliness [at] gmail [dot] com. Let me take you on a little tour of my house. Right now, I have laundry in drawers, laundry on the floor, clean laundry on our downstairs couch, dirty laundry in 3 big bins, laundry in the washer and laundry in the dryer. I have dishes on the table, dishes in the sink, dishes on the counter, dishes in the cupboard, and dishes in the dishwasher. In short, I am constantly chasing the elusive feeling of ever being done with anything. 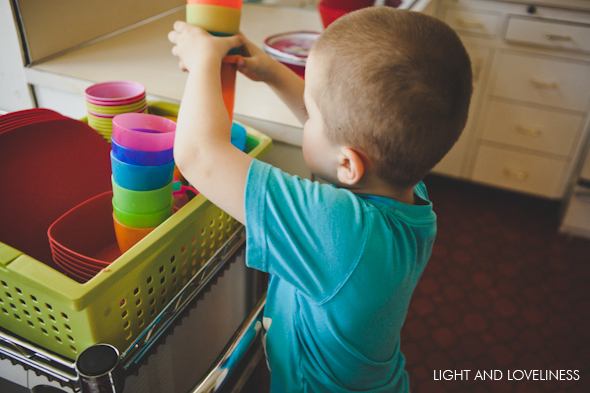 It’s not just laundry and dishes…it is all the tasks a mama must tackle again and again day after day. I need to make dentists appointments (again) and buy new curriculum (again) and update a few of the kids’ wardrobes (again). No matter how recently I have finished a task, it seems like the same task is hanging over my head, needing to be done again soon. Keeping up is really tough, if not impossible at times. For this reason, I champion the soul-care of mamas with fervor. You have to insert that time somewhere or you risk sinking into total discouragement. I speak from experience. Today I want to share a few strategies to help any mamas who might be reading this that don’t know how to hop off the hamster wheel every now and then, and a few strategies that might help you feel a little less overwhelmed with all the doing of motherhood. Every mama needs to have a measure of vision and momentum to tackle everyday battles in the home with any success. This might be accomplished by carving out morning devotional time, exercising, having a coffee date or play date with a friend, spending an evening with a good book, or getting out for a date night with your sweetheart. If you wait for space to magically open up for these things, you will be waiting a while, so do yourself a favor and put some on your calendar ahead of time. This might include paring down clothing so that your laundry cycle only contains in-season clothes that are correctly sized for your people. It might mean serving lunch on napkins or family-style (sandwiches and finger foods are great for this). This might mean making a meal plan that allows you to prepare foods ahead of time in batches so you’re not staring at the stove at 5pm wondering what to eat. Whenever I start to feel overwhelmed, I step back and ask: How can I possibly make this easier on myself? Look for ways to streamline household tasks so you can spend less time doing what is necessary and more time doing things that you enjoy. Put a date on your calendar once per season to pare down clothing. Invite a friend to help you and offer to return the favor. Chores are always better with friends. Keep a box or receptacle to toss items for donation that are too small, no longer wearable, not liked, or too big, and weed those things out continuously as you go through your regular cycle. I invite my children over 5 years old to voluntarily toss clothes in there that fit the requirements, and since implementing this, I have had some relief from this task. Make a meal plan that includes spaces for breakfast lunch and dinner daily. You can use the same plan over again weekly, or if you are feeling more ambitious, make a meal plan for a month and reuse it again the next month. 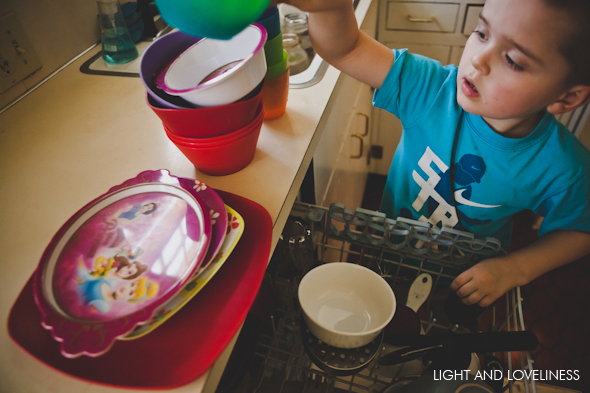 Before serving a meal, prepare the sink with a soapy tub of water so at the end of meals, your kids can scrape their own plates and plop them in the water. Then, when you go to wash the dishes, there won’t be any crazy scrubbing to do. When I am preparing to leave the house, I ask the kids to clean up 10 things from the floor, or I ask them to spend the last 10 minutes before departure times to re-set as many things as possible in our common area so whenever we return from our adventures, it is relatively tidy. They receive special treats for this, because it is a special treat for me to arrive home to a clean house. Make a kit in advance for the car that contains non-perishable snacks, water, change of clothes, and anything else you might need out if you forget (or choose to forget) items on the way out the door. These are just a few ideas (most of which I currently use myself) that may help you stay ahead of the tidal wave. Brainstorm some ideas of your own that can make your household systems easier! It has taken me a number of years of marriage to realize that my husband can’t read my mind. He also can’t read my clues, even if I think they are totally obvious. He needs me to say out loud (with kind words) what I need help with, and most often, he leaps into action to help me get caught up when I’m especially behind. I know that not every family has the same dynamic, so this may not yield the same results for you, but my point is that sometimes spouses are very willing to do what they can to help or encourage you if they know what you really need. Since I’m the at-home parent, I try to handle 90%+ of anything that needs to be done at home, but there are times I just can’t catch up without a hand, and communicating about it has made a huge difference. 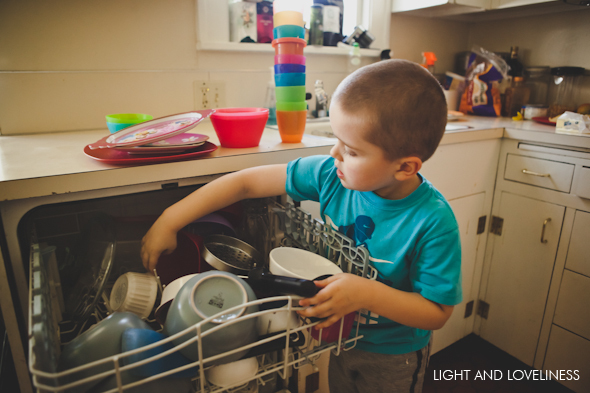 Children are very capable of helping with household tasks. 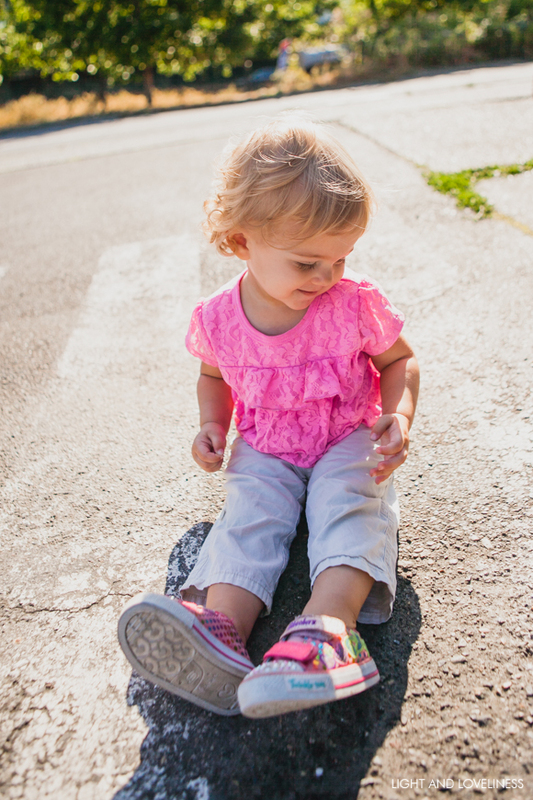 Sure, there is a stage where they undo every last thing you try to accomplish (hello 1.5-2.5 year olds…I know your game), but that stage doesn’t last forever, especially if you recognize early that even young children can be involved in the care of their home. I reserve a few tasks that I see as solely my responsibility (a personal choice) and all other household jobs are available for children to complete at my request. Age four is when I begin to require tasks to be completed to a satisfactory standard, but my kids begin helping alongside me at a variety of tasks when they’re 2. They love it. I love it. It also goes a long way to establishing strong work ethic, personal responsibility for the space they live in, teamwork, and character-building. It’s not all roses, for sure, but with diligent effort over time, you can have a team that is working together for the peace and order of your home. 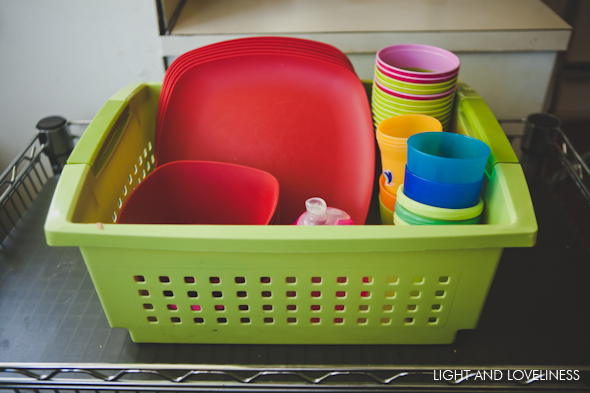 Do you feel like you are doing dishes 20 hours a day? (I do!) Paper plates can alleviate a tiny bit of that. I don’t use them all the time, but if I’m in an especially overwhelming season or week, you can bet I’ll serve on paper plates a few times without any guilt. One last help: I keep a convenience meal in the freezer at all times, for the days that my dinner plans just don’t come together. This might be a homemade casserole or a store-bought dish that can be popped in the oven at a moment’s notice. If my goal is to see that meal stay in the freezer for up to a month, it helps me stick with my meal plan, but never leaves me in a lurch. So there you go, mamas. I would love to hear about your strategies for keeping up! Leave me a comment or send me a personal note! 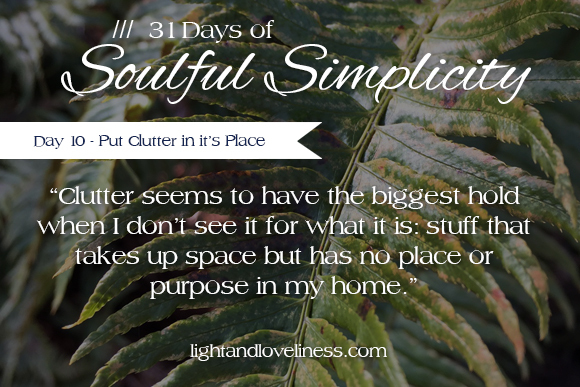 This is day 10 of Soulful Simplicity, a 31-day series through the month of October. The first week of the series can be found here. I hope you are enriched by this series. If you have any questions or would otherwise like to connect, feel free to send me a note: lightandloveliness [at] gmail [dot] com. Have you ever wondered why the storage container industry is as lucrative as it is? Consider this cycle: A person buys some bins to hide the volume of their things away from view. More things find their way into the home. Person decides there is nowhere to put the new things because the existing bins are full of other stuff and it seems easier to add bins than to empty some. Person visits the container store for more bins. Not that I know anything about this cycle or anything. It is easy to fall into the trap of thinking that we need more things in our lives in order to find more peace. Marketers put a lot of effort into sending us messages about what we ‘need’, and often we buy it (pun intended). Letting go of a few dollars feels less painful than the deeper, harder work of dealing with and clearing out the unnecessary things, so we settle for a temporary fix instead of engaging a real solution. I feel like I should offer a confession that I am not the tidiest person, and organization has only become important to me in recent years because of the growing number of people who live in my house. Decluttering has become a necessary survival skill. Eight people living (and learning and making and eating) in a house can be a quick recipe for mayhem. It is simply not a choice to forego decluttering at regular intervals if I want to have any sense of order here. In the past, clutter has been a source of shame for me. I am well aware that organization is not my forte, and have had a dramatic relationship with clutter for a lot of years. The constant, persistent, unending clutter cycle is at the top of my list for “things that make me frustrated”, and I have gone through cycles of ignoring it for as long as possible, followed by manic episodes of tearing apart every corner of the house–trying to purge unwanted stuff and not allowing anyone touch, play with, or make anything if it meant making a big mess to do it. I have made a lot a progress in this area over the years. I don’t have any magic-bullet secrets for you, but I’ll share a few of the things that get me through. Remembering my priorities and the purpose of my home helps me approach clutter and household organization with new eyes and intention. I’m not a fan of perfectly organized homes at the expense of real-life lived with love, connection, and teamwork within the family. For me, remembering my priorities for family harmony help me both dig in to the decluttering process when its needed, and let it go when its not. My motivation is to hold the purpose of our home in high esteem, and all the effort I make to declutter and organize my home in light of that is made on purpose, not out of obligation or fear of the judgement of others. Small steps toward order really make a difference. I see my household spaces a little bit like my refrigerator that can store what I put there for a time, but must eventually be inspected, cleaned out, and refreshed for the next items that need the space. When I take care of one small thing, that is one less thing left to do, and when I purpose to take a small step at a time, I don’t feel so overwhelmed by the larger need/project/task. Starting somewhere is the very thing that gets you places. I try my best to deal with clutter matter of factly instead of getting caught up in clutter-drama. 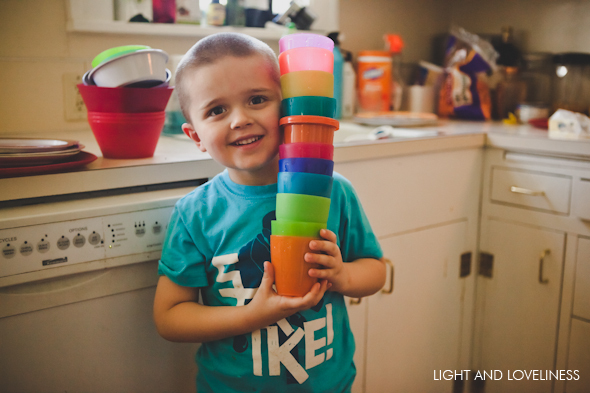 I already know that I have to tackle the clutter monster at my house on a daily basis in order to create space for us to learn together, eat together, and rest together. I set micro-goals for myself to accomplish as I’m able (10 minutes on a timer with music in a particular space, one bigger organization project per week, etc) and find that knowing my organization/decluttering goals are met for the week help me continue making progress without allowing this stuff to hijack my other priorities. If I start getting discouraged, excessively frustrated, and less-than-kind with my kids about it, I will set everything down and come back to it when I have shed the drama. Most often, these are the times I’ll pack up and head to the park where there are lovely trees overhead and laughing children—all at a distance from me so I can clear my mind. If I’m decluttering a room, I work from the perimeter and sweep or move everything into the center of the room where it can be seen. My kids know that when the pile starts forming, it is their job to find like items in it and put them together and/or put them away. On the spot, someone gets assigned lego (since there are lego bricks in literally every room of my house at all times), someone gets assigned recycleable items and prowls around with a paper grocery bag to get all the recycling into it, someone takes on shoes and laundry, etc. This real-time teamwork provides us a good amount of momentum, supplies an opportunity for the kids to work together and encourage each other, and has been more effective for me than assigning specific chores to individual children to be completed separately. It also makes clean up time last about 10 minutes when it would easily take me an hour by myself. If I’m decluttering a closet, pantry, or closed container, I find a staging area and dump everything out where it can be seen. Clutter seems to have the biggest hold when I don’t see it for what it is: stuff that takes up space but has no place or purpose in my home. I find it easier to say goodbye to what is unnecessary when I can look at it and realize that it serves no purpose other than to make more work for me. No thanks, and out it goes! What are some ways that you put clutter in its place? I’d love to hear your wisdom on this topic. A wind blows through and turns the house upside down. It’s the wind of youthful energy, and it comes with sparks, wonder, quarrels, questions, messes, attitudes…and so much more. Not long ago, I would easily be swept into the wind, tossed all about with anxiety and stress, wanting so much to do it all perfectly, to manage chaos and make space for good things, but unable to get my hands on the reins to steer the wild horses. I did not wake up one day with a lightbulb over my head and a perfect solution to my troubles, but I have slowly, over time, grown to understand that I can have peace, purpose, and direction no matter what is going on around me. It comes down to rhythm. Or rhythms, plural. My twenties proved to be a decade-long struggle to find any sense of rhythm to life, and it started with my inability to recognize that I needed some rhythms if I also wanted peace. I was on an epic thrill-ride, throwing my heart into everything with gusto, sometimes without thought as to how one choice might affect another. Having no order to the day, the week, the month, and no vision for peace throughout the various facets of my life often left me with heartaches, frustration, wasted energy, wasted time, and wasted opportunities. Suffice it to say, I have struggled for a long time to establish healthy rhythms. When it comes to music, some people think you either have rhythm or you don’t. We’ve all seen the one person in a group that is clapping opposite all the others, either striking the wrong beats or struggling to clap where there is a beat at all. We have seen people on TV who are learning to dance, but instead of gracefully moving with skill and precision, they awkwardly wobble through the unfamiliar steps. I relate, in many ways. But rhythm-in-life is not something that we just have or don’t have. It is something that we thoughtfully and intentionally establish, as we learn more about what rhythms look like and what they can offer us. As defined, rhythm is a strong, regular, repeated pattern of movement or sound, or a regularly recurring sequence of events, actions, or processes. That’s it. Just a pattern. Habits. The big rocks you put in your jar before filling the cracks in with sand and smaller pebbles. I think rhythms are especially important for mothers, and for their families. At least that has been my recent experience. I don’t think every family would jive with the same rhythms, but I do think every family can benefit from establishing ones that uniquely fit them. That said, I’ll share some of what that looks like for me, in case it helps to spark some ideas that might help you identify some rhythms you already have or want to establish. **Feel free to skip the rest of this entry if you like. It’s a peek into what works for us, but may not work for everyone. It is meant to be descriptive of our normal, not prescriptive of what anyone else should do. I tried to make it concise, but….that didn’t happen. Read on at your own risk! Morning Rhythms – Admittedly mornings have gotten easier as my children have grown a bit, but I try to let the kids know what to expect for morning while I’m putting them to bed the night before. If we’re planning to have a home day, I encourage them to stay quietly reading or playing in their beds until a specific time so I can have a more leisurely wake-up. If we’re planning to be out during the morning, I will tell them that when they wake up (either on their own or when I wake them), they need to be dressed and ready to head out the door without being prompted by me. Once they’re ready, they are to put their energy toward anything they can find around the house that needs to be done, which are typically things like: reorganize the shoe-cubby that is constantly destroyed anytime someone retrieves their shoes, pick up stray laundry from around the house and put it in the right place, put any toys away that might have been left out, get their water-bottles filled up and sitting on the table so they’re ready for when we leave. Mealtime Rhythms – Whatever the first meal of the day that we’re home for, I set a timer for myself to spend one hour in the kitchen. This is most often breakfast, but some days it is lunch, if we’ve had an early activity to be at that sends us out the door with granola bars & bananas. I know that probably seems like a long time to be in the kitchen, but I have found that it works for me to just set the timer and commit to it. 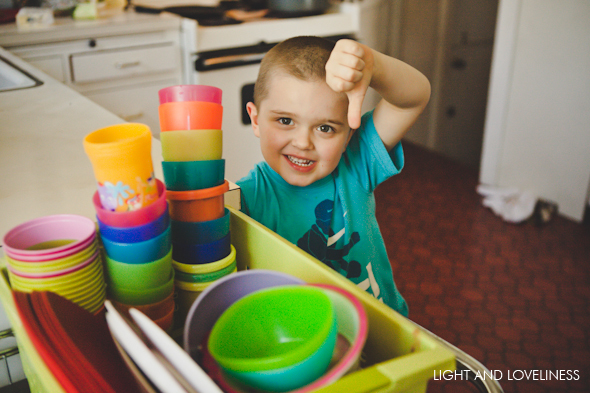 At night, after I put the kids to bed, I do not spend time in the kitchen finishing up dishes, or around the house putting everything back in order. I like the quiet of the late evenings, so I spend that time writing or doing other creative things I’m not able to do when the troops are awake. Instead, I do this morning routine: wash and load dishes, make breakfast, set out meal items for the day that need to be defrosted, prep meal elements for dinner that I can stash away in the fridge, clean out the fridge and pantry and take stock of what I need from the store that week. I put on some music or listen to the audio option on YouVersion, delegate other tasks to kids who wander in and need something to do, and put in the time. I feel like it gives me a return all day long, when I come back to rinse just a few dishes after lunch, or start dinner with everything half-done for me already when we get to 5pm. Bible Study Rhythms – I love the Bible, but I will not read it if I don’t have structure and accountability to do it. I accomplish this by participating in CBS (Community Bible Study) during the school year, and by hosting independent studies with a friend during the summer. I like listening to the Bible on YouVersion’s iPhone app, and as I mentioned above, do that most often when I’m cleaning the kitchen or driving somewhere. I don’t study the Bible because I ‘should’, and I don’t think anyone should ever feel guilty for not studying it. I study it because it gives me strength, grows my understanding, challenges me, and helps me through days in ways I can’t fully articulate…so in that way I totally recommend it, but it should never be something done just to check it off the list. Fitness Rhythms – I have never been into fitness. In fact, I avoided it like the plague for a good 12-15 years until it was clear that I needed to make some changes. It’s not that I didn’t know exercise would be good for me, its that I didn’t know where to start, and I didn’t really think it was necessary or feasible for me as I started adding more babies to my life. Something about bumping into my 30’s woke me up to the need for me to care for myself, especially in this area. I have seen my greatest successes this year in setting a goal to run or walk a minimum of 10 miles per week. Then I told all my friends about it so I could have their encouragement and accountability (which several have been outstanding about making sure I have both), and now I’ve run/walked almost 350 miles in 2015. This is huge for me! I accomplish this by going to the YMCA several days a week, where I can check my kids into a class for a bit while I use the treadmill, by walking with friends in the early morning (6 or 7am) or late evenings (8pm – when the kids have gone to bed). 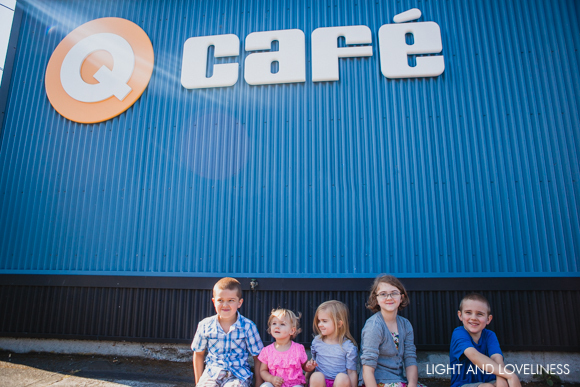 I probably go 6 days a week, consistently, and I can’t begin to say how life-giving it has been for me. I feel strong, energetic, clear-minded, not stressed all the time. Highly recommend finding your own groove. 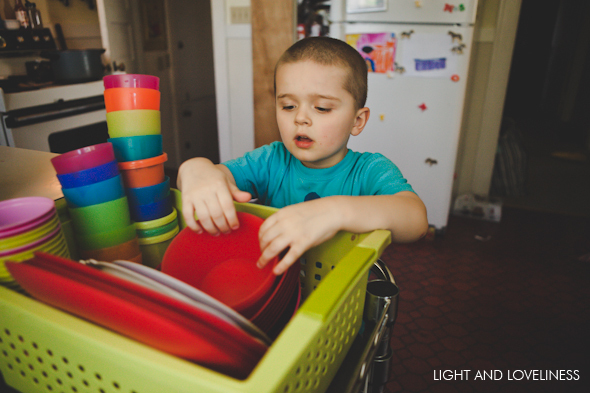 Chore Rhythms – I’ve tried lots of different approaches to kids and chores over the years. Charts don’t work for me. Assigning the same chore to a kid for a week or more doesn’t work for me. We do chores on the fly 1) whenever we’re preparing to leave the house (whoever is already ready gets assigned one or two), 2) before any meal time – If I’m in the kitchen preparing food, they are elsewhere in the house tending to a job they can complete in 5-10 minutes, and 3) whenever I get a wind to put everything in order. We start some hoppin’ music, I sometimes assign certain tasks, and everyone works together until the work is done, looking for things that can be done whether or not it has been asked of them. It’s not perfect, but I have seen improvement over time in the kids’ ability to recognize what needs to be done and their follow-through in getting it done without me nagging them to do it. Win all around. Homeschool Rhythms – This should have its own post one day, but for now, I’ll just say that I have a handful of things that the kids know need to be done every single day before they can do other fun things. School tasks may happen at different times on different days, but the rhythm for the kids is knowing the list of items they need accomplish before there will be any TV time or computer time. They will often bring a reading lesson to me because they’re ready to do it for the day, knowing that it will happen sometime anyway. I like that this approach makes them take initiative some of the time. There are some days we do things that are not on this list, but as a baseline, this keeps us moving through the week without me having to be the steam engine that makes it happen. Bedtime Rhythms – I already mentioned a little about these above, but I try to keep the order of bedtime the same, even for the older kids. At the end of the day, I’m spent and have very little left to offer, but I have committed to being as present with them as I can for at least a short time. Some nights everyone gets ready without a lot of drama, and those nights, I’ll sit with them to read or have discussions about all kinds of things they have questions about. We sing songs and pray. On nights, when they are not as cooperative, I shorten the story/question time, and have them fall asleep more independently. I rarely stay until everyone is asleep, but I do try to get them through the transition zone, where they have calmed down and are quiet in their beds. Because this takes my last bit of energy for the day, most days, that’s why I push all remaining chores left to do until the morning. Anyway…that ended up being way longer than I anticipated, but I hope you found some value in it. I feel like all of these things contribute to having a sense of order, peace, and harmony in our house. We have been using this cart in the kitchen since we moved in because we have only a small amount of counter space, and it has been re-configured a few times as our needs have changed. 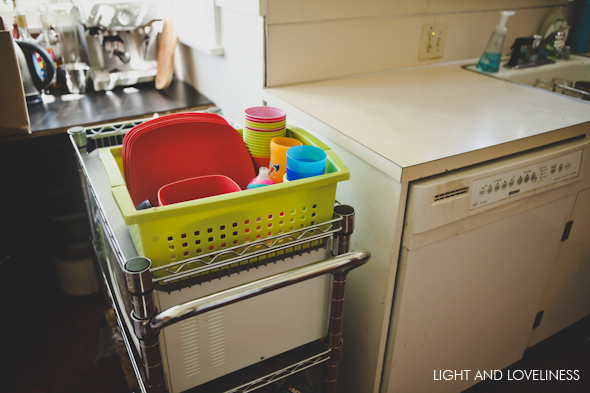 The microwave is now below and the basket rests on top so the kids can easily get what they need. 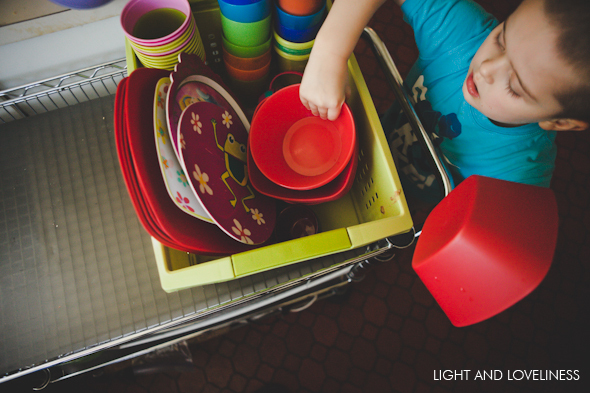 I typically direct one of the kids to unload the ‘kids’ dishes’ from the dishwasher and organize them in the basket. Here you can see J (5) doing the job. I have also had E (3) and A (6.75) complete this task without trouble. Sometimes it takes a little re-organizing to make everything fit just right, but J has gotten the hang of it. I asked him how he felt about doing this chore. And this was his response. Despite the thumbs down, I’ve never had to ask twice for this job to be completed. And somehow, just having someone else clear out the plastic things from the dishwasher makes unloading the rest of the dishes seem like a 1-minute job. I’m sold.